I really enjoyed this movie. Clemson Reade (Cary Grant) is in the Arab country of Bukistan on business. There he meets with the Khan (Eduard Franz) and his daughter Tarji (Betta St John). While he is with them Clemson learns that Tarji has been taught her entire life how to be the perfect wife. 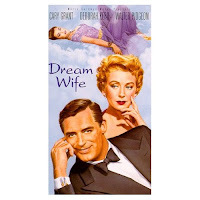 When he returns to America he meets with his fiance Effie (Deborah Kerr), a diplomat. After seeing how Tarji treats men he realizes what he is missing with Effie. He tries to work past his feelings but when Effie says she is going to postpone their wedding to work on an oil pact with Bukistan he has had enough. He dumps her and writes to Tarji asking her hand in marriage. She agrees and heads for New York with her bodyguard. However, to protect the precarious oil agreement the state department decides to appoint a diplomat to make sure protocol is followed. The only problem is that they appoint Effie! This was a cute little film. The sexist attitudes in the movie are definitely out of date but it was still enjoyable to watch. Kerr and Grant had wonderful chemistry together. All in all a great movie for all classic movie fans.